FILE - Ivanka Trump speaks during a forum at the Eisenhower Executive Office Building on the White House complex in Washington, March 22, 2018. A day after President Donald Trump canceled plans to attend the Summit of the Americas, Trump adviser and daughter Ivanka Trump announced she will unveil an initiative at the event to promote economic empowerment for women. The summit is scheduled to start Friday in Lima, Peru. The White House said Trump will not attend in order to focus on a U.S. response to a reported chemical attack in Syria and related developments. Speaking to reporters during a phone briefing Wednesday, Ivanka Trump said she will highlight the importance of promoting women's economic empowerment through public-private partnership at the summit. "While in Peru, I'm excited to announce a new initiative to propel women's economic empowerment in the region. Furthermore, to underline the joint collaboration between the United States and Peru, both in the public and private sector," she said. She did not provide further details about the initiative. The first daughter, who will speak at the CEO Summit of the Americas, said one goal is to increase the number of women in Latin America who open their own businesses. 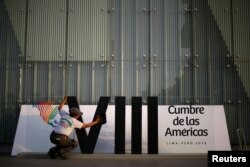 A woman cleans a banner ahead of the 8th Summit of the Americas in Lima, Peru, April 10, 2018. "Although women labor force participation rate in Latin America and the Caribbean improved from 44 percent in 1990 to 54 percent in 2014, rates of women-owned business formation have remained low at just 12 percent of all businesses," she said. While in Peru, Ivanka Trump will meet with female corporate leaders and entrepreneurs at the Lima stock exchange. She will also visit a local woman-owned business that sells organic products from the rural regions of Peru. A senior White House official said the initiative is in line with the Trump administration's overall security approach. "Within the national security strategy, there is a pillar entitled 'empower women and youth,' and it says, specifically, societies that empower women to participate fully in the civic and economic life are more prosperous and peaceful," said the official. "We support the efforts to advance women's equality, protect the rights of women and girls, and promote women and youth empowerment programs." President Trump originally planned to attend the 8th Summit of the Americas and travel to Bogota, Colombia, which would have been his first trip to Latin America. "At the President's request, the Vice President will travel in his stead. The President will remain in the United States to oversee the American response to Syria and to monitor developments around the world," press secretary Sarah Huckabee Sanders said Tuesday. The official emphasized there will be "a very high-level delegation" from the administration to attend the summit to "further strengthen the relationship between the United States and the Americas, and to promote collaboration, investment, trade and sustainable development." U.S. Deputy Secretary of State John Sullivan, Commerce Secretary Wilbur Ross, U.S. Trade Representative (USTR) Robert Lighthizer, U.S. Agency for International Development (USAID) Administrator Mark Green and Overseas Private Investment Corporation (OPIC) President Ray Washburne are departing Wednesday for Lima and will be joined later this week by Vice President Mike Pence and Senior White House Adviser Jared Kushner.